It was appropriate that when Sonoma County’s pilot project to build tiny homes for more than a dozen homeless veterans ran into one, then two, then three major roadblocks, it was fitting that the response was to just work around it and get the job done. Already thrown off course by a location change and the devastating wildfires in 2017, the final work on the set of 14 tiny homes was due for December 2018. Then the rain started. Contractor Michael Wolff, a Marine veteran who served in Iraq, had already underbid to ensure his firm got this job. And he wasn’t going to let anyone down now. 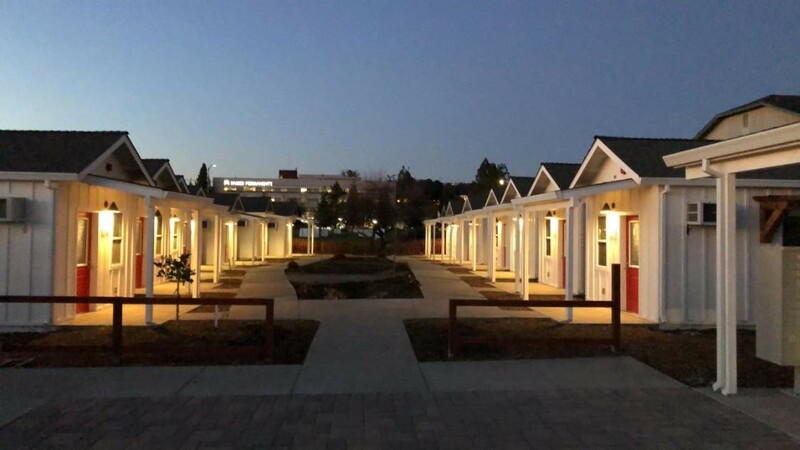 In January, Community Housing of Sonoma County named the set of 14 tiny homes after Wolff and John Zane, Shirlee Zane’s father, himself an enlisted Marine who fought in World War II. On March 20, the final veteran selected by the Veterans Administration picked up the keys to his home. Thanks to the HUD-VASH (VA Supportive Housing) program, 15 formerly homeless veterans, including one couple, will have rental assistance and case management on a plot of county-owned land. Sonoma County had been considering using tiny homes, 250-square foot minimalist structures, to house the homeless since 2014, and in 2015, Zane was pushing for an application to aid veterans, and to use county-owned land. Community Housing won a competitive bidding process to oversee the project. After picking out a plot between the sheriff’s office and the human services department and designing the homes for that land, it became clear that office space needs would force the project to move, between the jail and a hospital. Even after the challenge of changing design specs, going all the way back to the drawing board, as Cook termed it, the highest hurdle had yet to even appear. The 2017 Tubbs Fire devastated the county seat of Santa Rosa, burning hundreds of homes and increasing the building material costs. She was able to persuade the rest of the Board of Supervisors to make up the difference in costs. All homes are compliant with the Americans with Disabilities Act, sporting ramps, sliding doors on bathrooms, with a bedroom, shelves, desks, closets and a kitchenette. A communal space offers more room, a larger kitchen and laundry facilities. Community Housing is close to securing a donation of solar panels, which will allow the tiny homes to be carbon neutral. Two formerly homeless veterans live on site and serve as peer house managers, in addition to the HUD-VASH-supplied case workers. She also wants to present them with housewarming gifts. Word from the peer house managers was that they wanted a flagpole, so that is what Zane plans to bring them. On March 27, the U.S. Department of Labor (DOL) announced that $13.5 million dollars will be made available for grants to help homeless veterans re-enter the workforce under the Homeless Veterans’ Reintegration Program (HVRP). The DOL’s Veterans Employment and Training Service (VETS) expects grant awards to range from $100,000 to $500,000. The wide-open spaces that draw many to Montana’s Big Sky Country can be less appealing when it means traveling eight hours to reach services people need. The U.S. Department of Housing and Urban Development (HUD) recently announced as part of its Annual Homeless Assessment Report that veteran homelessness decreased 5.4 percent in 2018 relative to 2017, completing a decline in veteran homelessness of almost 50 percent since 2010. The Honorable David J. Shulkin was nominated by President Trump to serve as the ninth Secretary of Veterans Affairs (VA) and was confirmed by the United States Senate on February 13, 2017. Prior to his confirmation as Secretary, Dr. Shulkin served as VA’s Under Secretary for Health for 18 months, leading the Nation’s largest integrated health care system, with over 1,700 sites of care serving nearly nine million Veterans. County News interviews Veterans Affairs Secretary David Shulkin at the 2018 Legislative Conference in Washington, D.C.